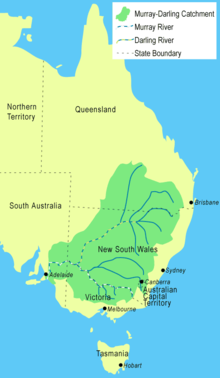 The Murray-Darling Basin is an area in Australia around the Murray and Darling Rivers. Three million Australians inside and outside the basin are directly dependent on its water. About 6 per cent of Australia's total rainwater falls into the Murray-Darling Basin. About 85 per cent of all irrigation in Australia takes place in the basin, which supports an agricultural industry worth more than $9 billion per annum. The Murray-Darling Basin covers 1,061,469 square kilometres (409,835 sq mi) or approximately one-seventh (14%) of the total area of Australia. Over two million people live in the Basin. ↑ Prideaux, Bruce (2009). "River Heritage: the Murray–Darling River". In Prideaux, Bruce; Cooper, Malcolm. River Tourism. Wallingford, United Kingdom: CAB International. p. 167. ISBN 1-84593-468-7. This page was last changed on 26 October 2017, at 03:29.